Hanuman Sitting on Bharata’s Arrow to Reach Lanka in the Ramayana should not be seen as a figment of imagination. There is deep symbolism attached to it. Hanuman who was carrying the mountain with medicinal herbs was misunderstood by the residents of Ayodhya as a flying monster. 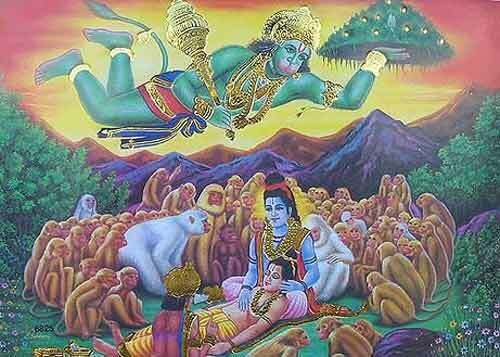 They informed Bharata, their king, who shot an arrow and forced Hanuman to descend to the ground. When Bharata realized his mistake, he wanted to help Bhagavan Sri Ram. Hanuman told Bharata that he could of great help, if he could make him reach his destination fast, so that he can save the life of Lakshmana. Bharata then meditated on Rama and mounted an arrow on his bow. He asked Hanuman to sit on the arrowhead. He then shot the arrow, which soon attained the speed of sound, and Hanuman reached his destination – feet of Bhagavan Sri Ram. Symbolically, this incident narrates the greatness of Bhakti. Bharata was the greatest Bhakta of Bhagavan Sri Ram. His Bhakti was unfathomable. There is no comparison. He had no doubts that Sri Ram was Bhagavan. This is the reason why Bharata was able to put Hanuman on the tip of his bow and carry him to the feet of Sri Ram. Bharata knew that he was not going to perform this miraculous deed. Bhagavan was performing it. He was a mere instrument who had complete belief in Sri Ram. Unwavering Bhakti can perform miracles. It can move mountains and perform unheard feats. But it is hard to find a bhakta like Bharata today. A seed of doubt remains in the mind of even the greatest devotee.